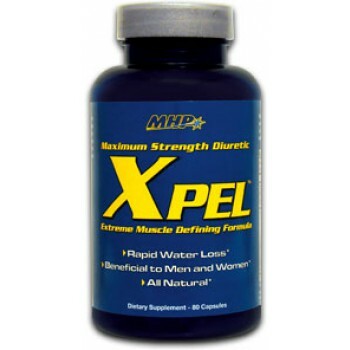 MHP's XPEL is a powerful herbal diuretic designed to help the body eliminate excess water retention from beneath the skin. This maximum strength botanical formula also supplies the proper balance of vital electrolytes that helps maintain muscle performance and muscle fullness. XPEL's proprietary formula is designed to eliminate water fast. It goes to work almost immediately, safely flushing out excess water while effectively replenishing key electrolytes to prevent cramping and keep your muscles strong. The Fastest Acting and Most Powerful Water Pill - Xpel is for "Every Body"! At any given time, you could be carrying up to 10 to 20 pounds of excess water. This natural phenomenon is called "subcutaneous water", and it can easily contribute to a "soft and puffy" appearance and uncomfortable feeling. If you're a bodybuilder, subcutaneous water can prevent you from being "dialed in" at your next contest. If you're someone simply looking to lose a few pounds fast, subcutaneous water can prevent you from fitting into those jeans you want to wear this weekend! You train too damned hard to let it happen to you, but did you know that you may be holding as much as 10 to 20 pounds of unwanted subcutaneous water? It's hiding your hard, razor sharp muscles and cable-like veins. It's also covering up your critical cuts and hard-earned muscle definition. For Those Looking to Lose Weight… Fast - Extreme Water Release Pill Allows You to Begin to Feel Results in Just 12 Hours! Women commonly experience excess subcutaneous water around the thigh area, buttocks, even the stomach! They may feel it most around "that time of the month", but it's likely there all the time-excess water that just won't go away. XPEL is perfect for women looking to lose those last few pounds to fit into those special occasion dresses, bathing suits and other revealing outfits. XPEL can also be used to jump start the weight loss process for women who are just beginning a weight loss program. 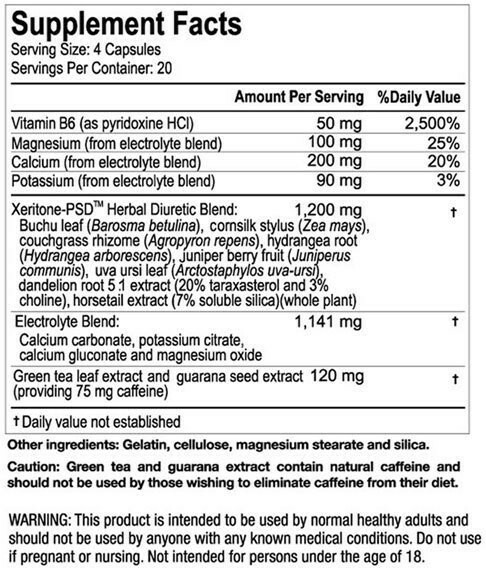 XPEL's patent pending Xeritone-PSD™ herbal diuretic blend uses proven fluid-reducing herbs to dramatically reduce water retention, while its electrolyte blend helps you maintain a normal body fluid balance. More than the typical "water loss pill", women can feel results in as fast as 12 hours! XPEL contains ample amounts of water reducing ingredients that go to work around your cells and keep the inside of your cells hydrated. It does not draw water from inside the cell to give a dry and "wrinkled" appearance. With XPEL, women will retain a vibrant look while eliminating excess water weight! Take 2 Serves per day, once in the morning and once in the afternoon. #Drink at least 1.5 litres of water throughout the day as well.